One example of the lack of women writers in translation is the dearth of Independent Foreign Fiction Prize winners of that gender. When Jenny Erpenbeck claimed the award with The End of Days this year, many declared her the first ever female winner. In fact, when the prize returned after a five year absence in 2001, it was won by Marta Morazzoni for The Alphonse Courrier Affair, an award that later went temporarily missing from the prize’s history. (You can read a review of The Alphonse Courrier Affair here). This still represents a depressing 2 out of 21 winners – less than ten percent. The Alphonse Courrier Affair was not Morazzoni’s first work – or indeed, her first work translated into English. Prior to writing the novel, she had published a collection of short stories – Girl in a Turban – in Italy in 1986, swiftly translated into English by Patrick Creagh in 1988. All five stories are set in the past (the 16th, 17th and 18th centuries), often touching on the lives of famous historical figures, and all, in one way or another, contemplating mortality. In accepting death Mozart rediscovers his prematurely vanished youth. The idea of a good death features in a number of the stories, most noticeably in ‘The Last Assignment’ which tells of Charles V’s decision to retreat to a monastery in the final years of his life through the eyes of Don Luis, a noble who is called to follow the King and is placed in charge of providing provisions for the royal party. Don Luis seems a simple man who goes about his task to the best of his ability, but he also strikes up a relationship with a gypsy whom he passes on the road to and from the town. He helps her when he finds her fallen on the ground, and she later returns the favour when he falls ill; and yet, you would not call their relationship even friendship. After his illness, Charles takes him into his confidence and allows him to read his memoirs, which he takes charge off after Charles’ death, deciding not to release them into the world for reasons we never discover, yet somehow seeming entirely in keeping with his character. Though reluctant to sell it, he eventually does, taking the trouble to travel to Denmark with it. He is remembered by the buyer’s daughter when her father dies, and the picture is seen to rise above the commercial bargain they made. Although death does not feature in the two remaining stories, ‘The Dignity of Signor da Ponte’ centres on an act of violence which we might assume the title character fears has ended in death, and ‘Order in the House’ concerns a living death as its protagonist, Karl, finds himself suddenly paralysed. 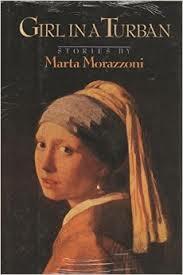 Morazzoni’s stories do not attempt to be neat or tricky; they moved with a staid pace in suiting to their settings. Each feels particular to its time period yet has a certain mythic quality thanks to her choice of subjects – kings, paintings, composers. None ends with a shock, yet each conclusion, on reflection, seems well-timed. Given that these were Morazzoni’s first published work, she handles the pressures of historical writing, especially with the use of characters who have actually lived, with enormous confidence. A writer who deserves to be rediscovered. You are currently browsing the archives for the Marta Morazzoni category.